Details of The Royal Opera’s 2015/16 Season have been announced. The Season opens with John Fulljames and Hofesh Shechter's staging of Gluck's Orphée et Eurydice starring Juan Diego Flórez, and includes a world premiere of Carlos Acosta's Carmen. 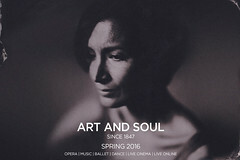 Highlights this Season include a new Royal Opera production of Chabrier’s delightful comedy L’Étoile, Will Tuckett's Elizabeth and a Royal Ballet mixed programme devoted entirely to work by Christopher Wheeldon. The Season features a new production of Boris Godunov from Richard Jones starring Bryn Terfel, and the world premiere of Liam Scarlett’s Frankenstein. Highlights include Obsidian Tear, a new one-act ballet by Wayne McGregor, an operatic adaptation of Sarah Kane’s 4.48 Psychosis and a new production of Verdi’s iconic tragedy Il trovatore.